‘The Ballad of R. D. Laing’ by Conor Carville, which is published for the first time in Prac Crit, takes a specific image as its point of departure. The poem’s speaker, browsing in a charity shop, makes the chance find of a copy of Life Before Death, the 1978 LP issued by Charisma Records, which features poems by the Scottish psychiatrist R. D. Laing set to music by composers Ken Howard and Alan Blaikley (the album can be heard in full online). He looks at the rather terrifying image on the sleeve of the record, created by photographer and ‘combination printer’ Hag. Starting from this image, located in a specific cultural moment when ‘poetry and psychiatry / shacked up for a time’, the poem follows a madcap route through ten stanzas, drawing in a wild array of historical remnants from anthropology, psychiatry, electronic music, SF and private memory. ‘The Ballad of R. D. Laing’ carries forward many of these qualities: the eclectic learning, the inventive rhyming, and the phrase-making that ‘come right with a click’, to quote a phrase from the poem (channelling W. B. Yeats’s idea, expressed in a letter to Dorothy Wellesley, that ‘a poem comes right with a click like a closing box’). And it gives freer rein to what Conor calls the ‘headlong, propulsive quality’ of his writing, working on a larger scale than the poems in his first book. Conor is also the author of a scholarly book, The Ends of Ireland: Criticism, History, Subjectivity, published by Manchester University Press in 2011, and teaches English and Creative Writing at the University of Reading, where we were colleagues from 2012 to 2015. This interview was conducted by email in June 2016, while I was in Berlin and he was in London. Could you tell me something about the attraction of R. D. Laing as a figure? It seems to me there’s been renewed interest in Laing and ‘anti-psychiatry’ in recent years. Well he’s someone I’ve been aware of for a long time. I read at least some of The Divided Self in Dublin when I was in my early twenties, and later I read the biography. Then in the early Nineties, when I moved to London, I noticed that whenever I went into a charity shop – and I did that a lot – there would always be at least one copy of Laing’s poetry book, Knots. Always. I don’t know why that was, perhaps it’s just that it was so bad that everybody who bought it off-loaded it. But why did so many people have it in the first place? Anyway, that intrigued me. It was like this constant, dog-eared, damp-stained remnant of something that had happened before my time. So there was something weirdly potent about the book, not due to what it said, but as an artefact. It was somehow charged and talismanic, like a Heaney object, except not a farming implement. A trace in the collective memory. I agree that there is a lot of interest in Laing now, just as there is in people like Ballard, or Anna Kavan or Ed Dorn. It’s part of a dawning realisation that the moment in which those people emerged was the tail-end of a distinct historical period that is now definitively over. There’s a lot of conscious, curatorial retrieval of the 70s as a result. The exhibition about the Themersons at Camden Arts Centre at the moment, for example. Or Luke Fowler’s films about Laing and Cornelius Cardew. But I guess I’m more interested in unconscious retrieval. You mention Heaney – a Northern Irish poet can hardly begin a poem with the word ‘Between’ without recalling ‘Digging’, and the now-commonplace idea of Heaney as ‘a poet of the in-between’. But whereas Heaney’s talismanic objects give access to personal meanings that seem authentic and rooted, and to provide origin-myths for his own consciousness, your poem is more interested in accessing memories that are cultural and mediated by specific technologies, and they lead to an encounter with a mysterious other: ‘eyes that are not mine’. Were you writing against that idea of the Heaneyesque encounter with an object whose significance is personal? It is hard to overstate the significance of Heaney for me. Growing up where I did, he was a kind of fixture, and everyone, absolutely everyone, knew who he was. It seems strange now that the most immediately visible writer or artist in the public sphere should be a poet, but that was the case, and his presence also meant that writing poems seemed an eminently sensible thing for someone like me to do, which is, needless to say, also very strange. Heaney was of the exact same generation and background as my parents, and so I also recognised a lot in the content of the work. And yet my own experience was very different. For example, I very vividly remember as a child spending Saturday afternoons going to visit my great-uncles, my grandmother’s two brothers, who lived on a small farm a couple of miles outside the town where I was brought up. Neither of them had married, and they lived in a long low whitewashed cottage, with a clay floor, no electricity, a pump in the yard and so on. The kind of existence that had not really changed for centuries. Heaney territory. We’d stay a few hours then drive back home, and on the way there would inevitably be an army checkpoint, paratroopers in camouflage facepaint with carbines and walki-talkies. After that we’d rush on so as to get back in time to see Dr Who, and my brothers and I would spend the next half an hour happily watching Tom Baker stagger around a space station with his face covered in slime. That journey took about 10 minutes, from Irish peasant life, through an encounter with state of the art military power to the strange pulp modernism that the BBC was producing in the 70s. And I have no doubt that it was the latter that had the most profound effects, so that everything else was filtered through a sensibility engorged and warped by popular culture. And it was of course British popular culture. So yes that mediation is something I am interested in. But I’m not consciously writing against Heaney. Indeed Heaney’s poetry acknowledges mediation too. In the bog poems he is looking at photographs after all. And in fact, though I can’t prove this, I remember shocking mass-produced posters that were put up after one particularly horrific fire bombing, posters that featured the twisted, burned bodies of the victims that might have triggered the associations Heaney sees in the Danish images. But you’re right of course, there is a strong chthonic strain in his poetry, and also an absolute commitment to memory as a kind of redemption: ‘My last things will be first things slipping from me’ as he says in ‘Mint’. Those memories always seen to be delicate and beautiful for Heaney, whereas I worry that the last thing I’ll think of will be the winning song of the 1978 Eurovision. Yes, I like how jumbled the cultural artefacts that make their way into the poem are. Sometimes they seem linked by unconscious associations – in the first stanza alone, alongside Laing’s album-cover, we get allusions to Martin McDonagh’s A Skull in Connemara, T. S. Eliot’s line on John Webster as a playwright who ‘saw the skull beneath the skin’, Magic Eye images, the duck-rabbit made famous in Wittgenstein’s Philosophical Investigations… It’s like the logic of the charity shop combined with the randomness of memory. But the poem also seems drawn to different, older systems by which artefacts have been ordered: the columbarium in stanza one, with its neat pigeonholes for the remains of the dead; the library in stanza six; the Museum of Mankind, i.e. the old ethnographic department of the British Museum, in stanza 10. It seems, ironically, like a very internet-age concern with how cultural memory is stored and retrieved. I’d forgotten about the McDonagh play – I actually took that phrase, as he did I suppose, from Lucky’s epic rant in Waiting for Godot. Lucky is a kind of slave, a subaltern figure, and his speech is in response to his master Pozzo, who commands him to ‘Think, Pig!’. So there’s a parody of rational thought, and of rational ordering of thought, in the speech. But then these other, weird elemental images start to break through at the end, including the skull in Commemara, an ‘abode of stomes’ and, strangely but wonderfully, tennis. When its performed well it’s astonishing, but what I love is the headlong, propulsive quality that builds up, the way Beckett uses repetition to really get up a head of steam, so that the language seems to gradually colonise Lucky, take him over. He becomes a kind of prothesis being used by this abstract, onrushing discourse that has lost its moorings in reason and is functioning purely mechanically. I suppose I wanted some of that quality in the poem – when I read it I tend to speed up as I go along, and hopefully the repetitions and the rhymes give it a sense of rapid permutation and automatism. But on the other hand the form of the poem, the ballad form, is itself a kind of ordering, with its own authority and its roots in song and orality and the commons, and I definitely wanted to tap into that. Now I think of it, the title came to me first, and I liked the idea of bringing together a folk form with a resolutely modern figure. I guess the title of John Lennon’s The Ballad of John and Yoko was somewhere in the back of my mind. Now I’m toying with the idea of a The Ballad of J.G. Ballard, which will be mostly about traffic bollards. What you say about the internet is intriguing, because again you put your finger on something that does inform the poem at some level. 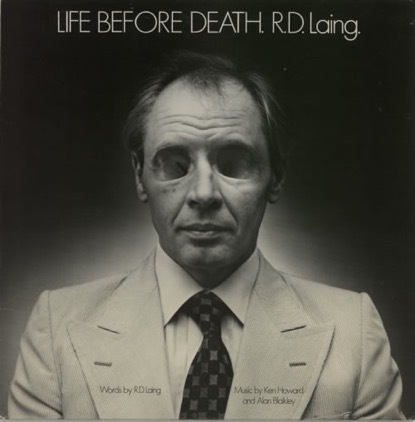 One of the things that attracts me to the album cover for Laing’s Life before Death is how crap it is as an image. It’s really crude and badly made by today’s standards of digital manipulation, where it would be absolutely seamless. Its what the artist Hito Steyerl calls a poor image, one at odds with the slickness of the digital. We’re now in the era of the fold and the warp rather than the cut and the collage, and as a consequence online space seems to me to be much more of a continuum rather than the antagonistic space of the junk shop or the disused shed. It’s true that both are spaces where a thought might grow, but the formal distinction between the internet and the charity shop, conjunction and disjunction, will affect the nature of that thought. I’m very interested in having those two strategies of relation in a poem, where objects, images and ideas are juxtaposed but also suspended in a kind of solution that connects them. Ashbery is brilliant at it. I’m interested that you mention the ‘authority’ of ballad form. It reminds me of how Derek Mahon worries in his Paris Review interview that talking about form and authority leads one towards ‘dangerous waters’. Rhyme, and a certain relation to traditional forms, are obviously very important in this poem and many of the poems in your first book – what are your thoughts on rhyming in the twenty-first century? I imagine Mahon is thinking about Yeats and the way he associated certain forms, like Spenserian stanzas or ottava rima (‘stadium stanzas’ as Paul Muldoon calls them), with power and purity, an antidote to what Yeats himself called the heterogeneity of the twentieth century. Yeats thinks forms like those can give a traction on modernity, so that the poet can stand outside it. This, paradoxically enough, is what makes him a modernist – the idea that, through the manipulation of form, art can tear through the veils and return us to a more authentic notion of the real. It’s impossible of course, there’s no outside, and the kind of passion for the real you find in Yeats and Pound and Wyndham Lewis certainly did lead to some politically dodgy territory. That’s all over, or should be, although there are still those who base their aesthetic around varieties of it, of that idea of a complete break, whether by returning to some illusory past, or some authentic experiential present, or some revolutionary beyond. So I have no illusions about this form or that form being innately authoritative or meaningful in that kind of a way. But I do think that the popular forms that emerge from below, so to speak, whether it be the ballad in the past, or the music you might hear on pirate radio or on somebody’s mobile on the bus have, as I said earlier, their own kind of authority, stemming on the one hand from being collective and often anonymous, and on the other from being constitutively impure and totally omnivorous. I guess by authority I mean they contest or negotiate more mainstream ideas, while always being deeply entwined and beholden to them at the same time. Something like the popular, vernacular ballad, as it develops, is always completely shot through with elements of the social and cultural formations it seems to be opposing. This is especially obvious in colonial situations, but it happens everywhere. So while there is no pure outside to the contemporary into which one can just leap, what can happen is a kind of miming and staging of the fractures and fault-lines that ramify through every social situation. Popular forms do that I think, they have a kind of agon running through them that mirrors the antagonism of the world, and I’m very interested in those kinds of possibilities. And, to finally answer your question, rhyme is a part of that miming. One often hears the cliche that rhyme is everywhere, and that that indicates the health of poetry. But it is less often acknowledged that the forms in which rhyme appears are kind of degraded, they are popular, subcultural, kitsch – rap and grime, graffiti, football chants, home-made banners, jokes, birthday cards, nursery rhymes. But then given what I said earlier this makes total sense, because if you are looking for a formal model of repetition with a difference, a formal demonstration of the subcultural or popular process of taking a standard or norm and progressively changing and twisting it and making it your own, then rhyme is perfect. That’s what rhyme does: it’s performative, iterative, it sets up a pattern and then rings the changes, as they say. Or certainly that’s true of the kind of rhyme that I am interested in – half-rhyme, slant-rhyme, eye-rhyme, internal rhyme – subtle variations on a single rhyme across extended stanzas, or even across a whole poem, which I also enjoy doing. so bunny morphs to duck. pimped to a cultic bonce. the haunch of my shoulder. bestirs itself and is prepared. and catch my own bright eyes. That hesitate. That cast themselves down. in The Museum of Mankind. halfway to becoming a skull.